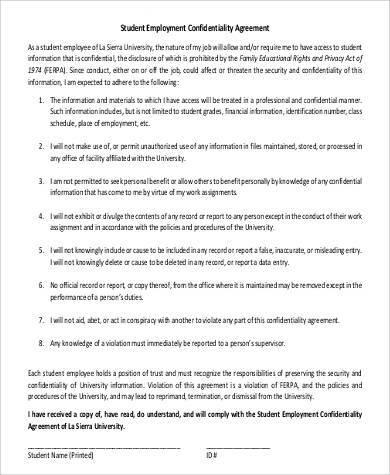 You would think that after going through a series of entrance exams and interviews, you’d be over and done with the recruitment process. However, you’re not. That awkward final interview is not the last step of the process just yet, but don’t fret, signing an employee contract could be the best thing and the most rewarding part of the recruitment process—and thankfully, the final step in the process. 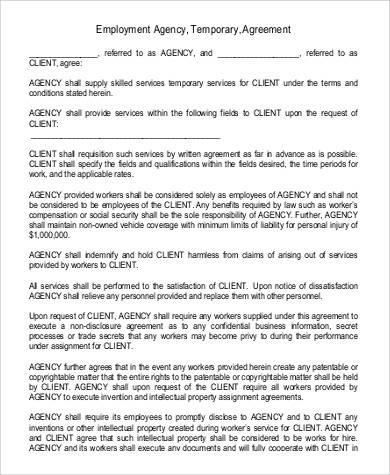 An employment agreement is a legally binding written contract that is provided by an employer to an employee. 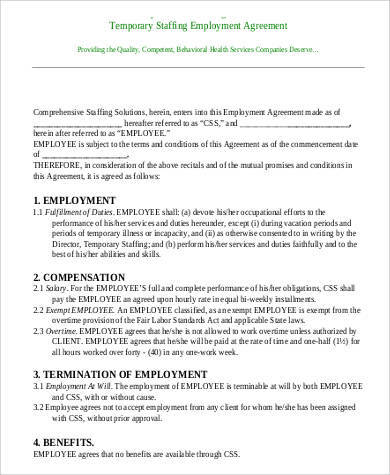 Employee contracts are necessary in the negotiation process of an employee’s compensation and benefits and is also a tool used by employers to lay down the basic terms and obligations that they require of an employee. 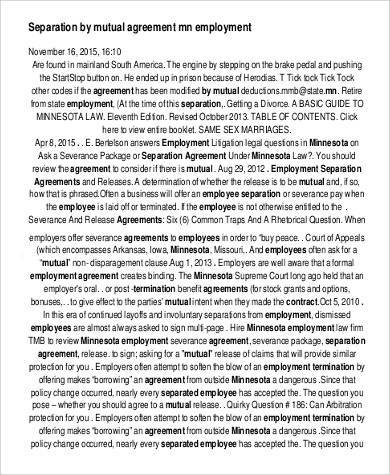 When Should I Use an Employment Agreement? 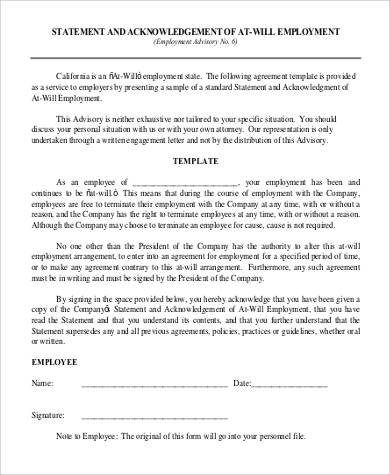 Employment agreements can be extremely valuable for employers who want to make sure that their employees are committed and dedicated to the company. They are also particularly rampant among companies who have paid a great deal to select or to train employee representatives and do not have any desire to spend a great amount of money on retraining substitutes or replacing them. 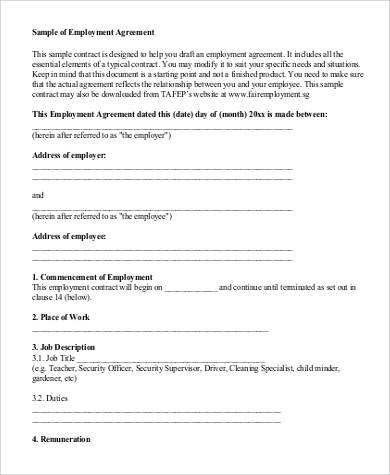 One of the advantages of a worker contract is that it secures an employee for a particular span of time and sometimes requires an employee to give due notice of at least ninety days in order for managers to find a substitute and to prepare him to take an employee’s place. 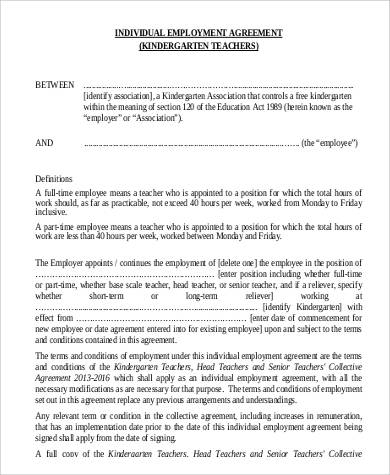 Other work contracts impose fines on employees who leave even before the stated time period, and, in spite of the fact that you can’t drive representatives to stick it out with you, imposing penalties can make them mull over leaving your company sooner than anticipated. 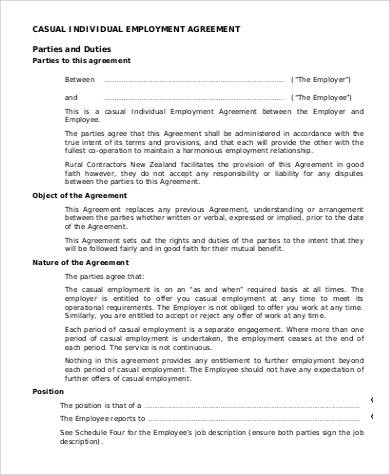 An employment agreement contract likewise assumes a fundamental part in ensuring confidentiality within the working environment or in business. 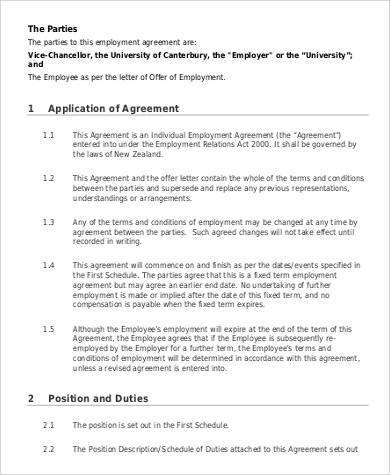 Most employment contracts contain confidentiality clauses and non-compete clauses in order to maintain the confidentiality of private and delicate data. 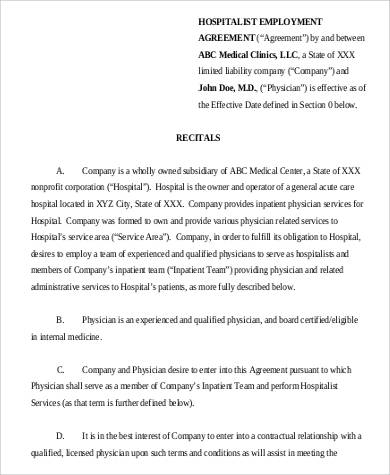 Confidentiality clauses are conditions that prevent an employee from releasing or unveiling any sort of work-related information that is related to work and disclosed for personal gain. 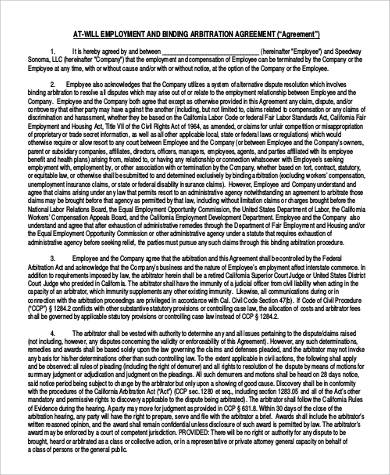 A non-compete clause, on the other hand, prevents an employee from competing against a previous employer or working for a competitor company in a period of at least one to two years. 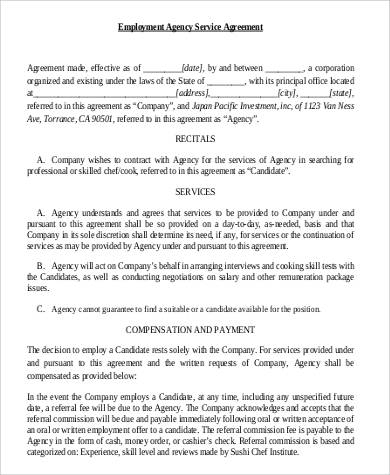 On occasion, a business contract is utilized to give an employee an offer that is difficult to refuse in the hopes of baiting them into working for a company other than the competition. This is typically done by offering a more competitive salary package, employer stability, and extra advantages or motivating forces. 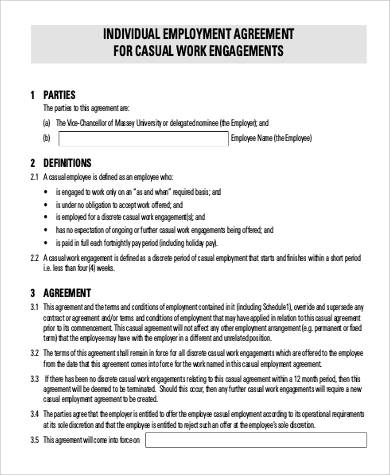 Employee agreement contracts can also be used to control over an employee’s level of execution and efficiency at work by presenting standards that the employee needs to meet periodically in order for him to retain his employment. 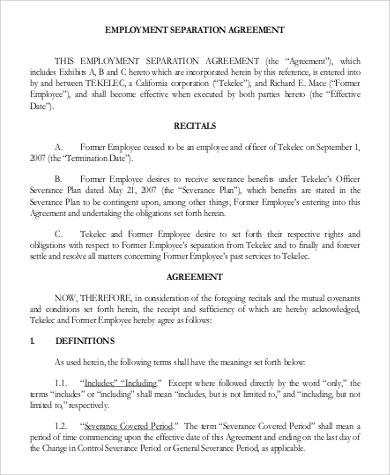 Employment agreements or employment contracts usually contain relevant and necessary details such as the employee’s name, the employee’s starting date, the amount of salary, schedule and work hours, attendance and leaves, and terms pertaining to the protection of the company’s assets and confidential information. 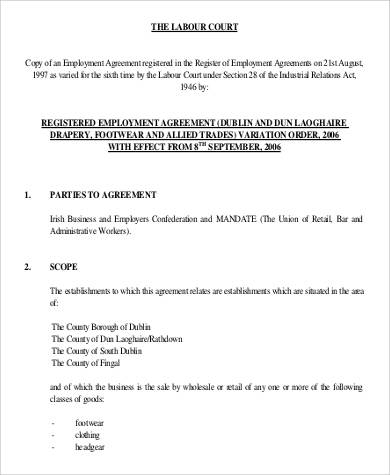 What Are the Contents of an Employment Contract? 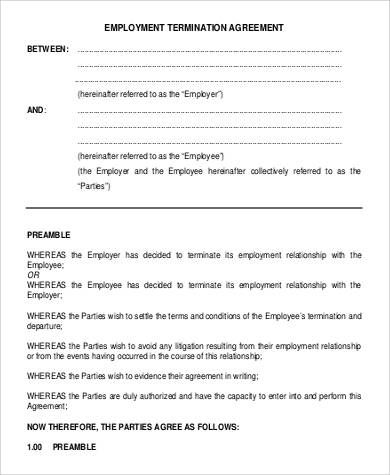 An employee contract is legally binding and therefore can forcibly commit an employee and an employer into abiding with the terms and conditions that have been stipulated in the contract. 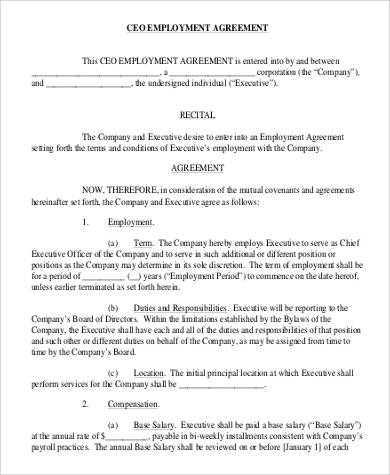 The Name of the Employer and the Employee – An employee agreement contract should always start off with the names of both the names of the employer and the employee. Date of Hire and End Date – Employees are usually paid off starting from the date that they were hired. 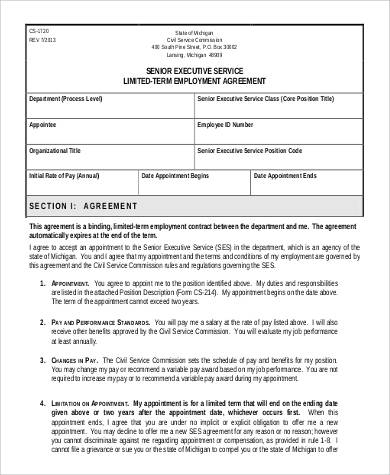 The employee’s start date should then be included in the contract. 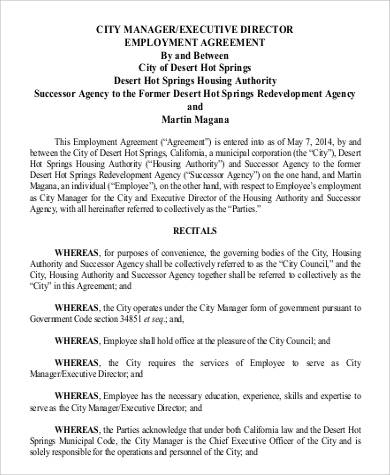 If the employee is on a contractual agreement, the end date should also be specified within the contract. 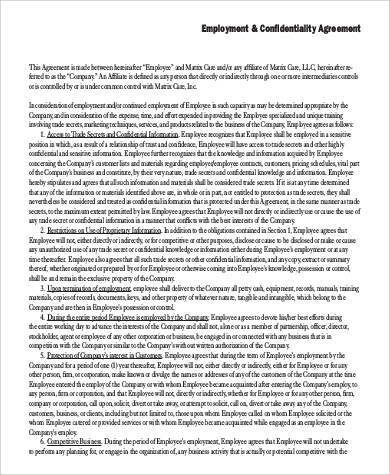 Job Description and Responsibilities – The employee contract should contain the employee’s work position and the responsibilities entailed to it in order to help set proper expectations between an employer and an employee. Work Hours – Employees need to be duly informed of the quantity of hours they are required to work in a day, in seven days, or in a month. Most managers require a full-time worker to work no less than 9 hours in a day, 45 hours in a week, and 180 hours a month. Other employers, on the other hand, offer a more adaptable work routine as long as an employee is able to accomplish and complete their work on time or before the due date. 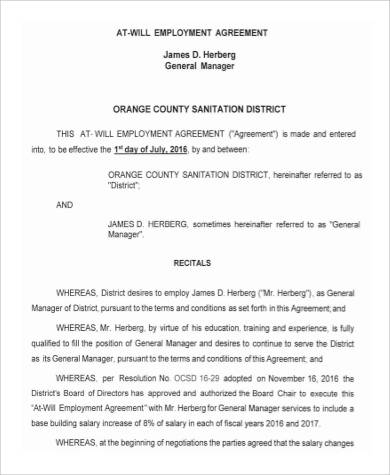 Salaries, Bonuses, and Incentives – Admittedly, the most important and interesting part of an employee contract is the compensation package. An employee’s monthly income is usually the deciding factor for an employee. 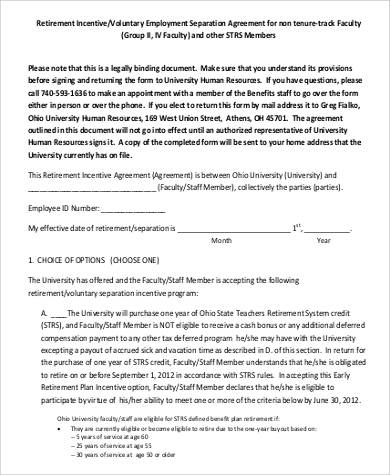 Which is why it should be stated in the employee agreement together with any form of deductions, incentives, cut-off schedules, and the date of the month when pay will be credited. Probationary Period and Regularization – Some companies have trial periods preceding the regularization of an employee. This stage is often referred to as the probationary period. 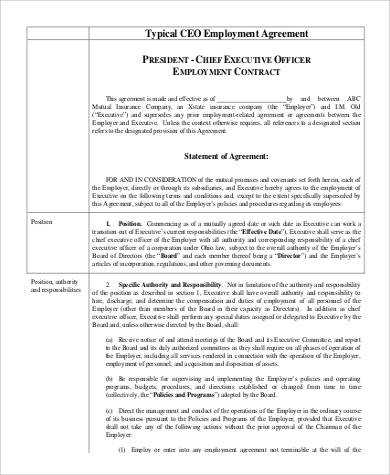 On the off chance that such is the situation in your company, then the terms paving the way to an employee’s regularization must be clearly expressed in the agreement, such as details on the length of the probationary status and the performance criteria that the worker needs to accomplish with the end goal for him to be regularized. It is likewise essential to reveal certain assessments being done month to month, quarterly, or every year and the comparing increment of pay rates and motivating forces for good performance. 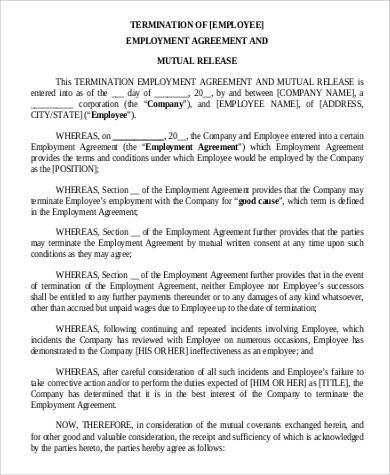 Grounds for Termination – Take note that unlawful termination could be grounds for labor disputes. 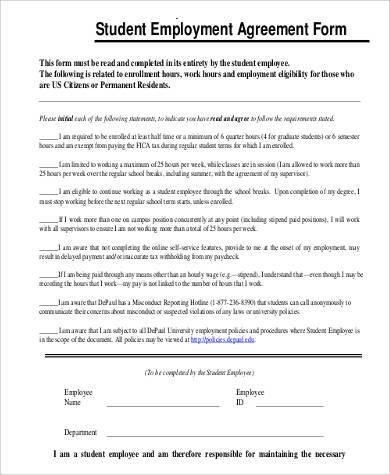 Be sure that you properly set out expectations among your employees when it comes to your required standard of performance and ground for expulsion. 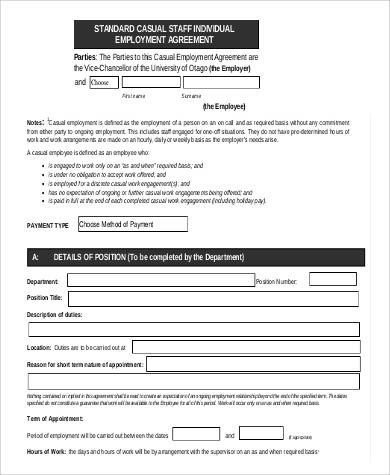 For example, if tardiness that is incurred more than three times in a month is ground for termination, be sure to provide appropriate action forms and documentations that will support your decision of having to terminate the employee. Attendance and Leaves – Employees who are often absent for work can bring about an encumbrance among businesses. 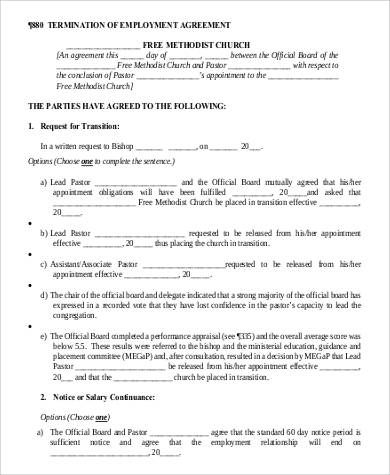 Executing and building up standards relating to participation, non-participation, and tardiness permits an employer to set legitimate expectations among his employees. 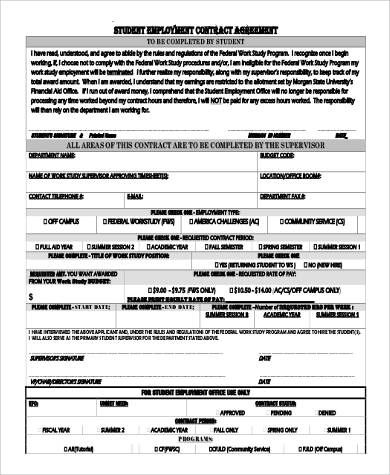 The quantity of sick leaves and vacation leaves should likewise be expressed in the agreement to help manage employees in regards to absences and tardiness concerns. 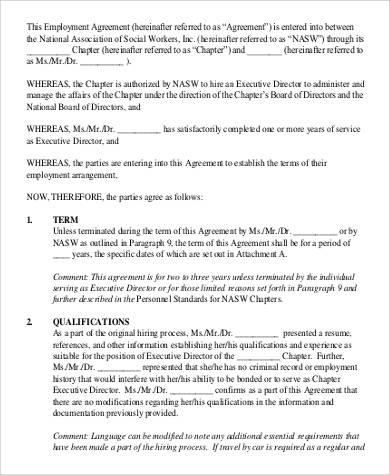 Non-Disclosure and Non-Compete Clauses – Most managers typically incorporate a non-disclosure and a non-compete provision within a contract. 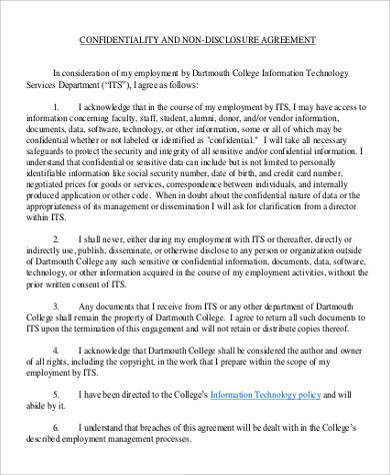 Non-disclosure agreements keeps an employee from releasing or sharing sensitive and confidential data about the company to outsiders or in non-business–related circumstances. 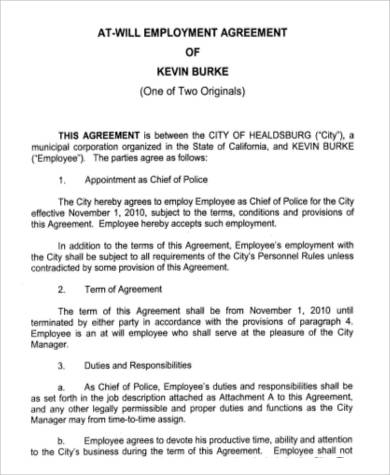 Albeit verbal agreements are not precluded by law, they are normally regarded invalid and are hard to demonstrate in instances of uncertainty or if challenged. 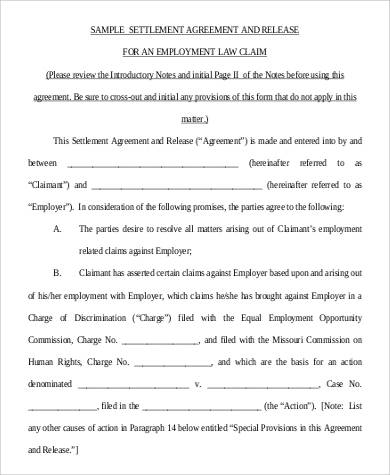 Written employment contracts provides clarity and serves as hard evidence at whatever point a misunderstanding emerges. 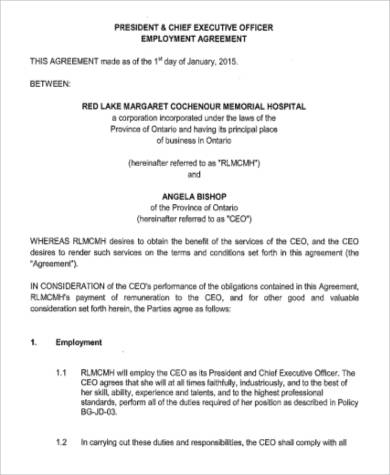 Employment agreements are critical documents that should not be trifled with. 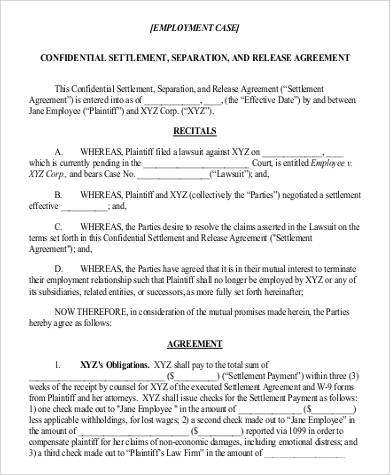 A lot of companies have been influenced fiscally because of claims recorded by employees relating to unmet expectations found within an employment contract. 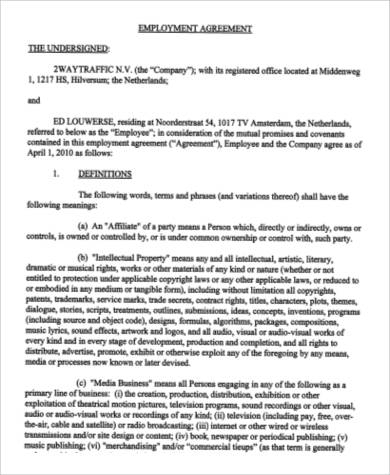 Secure yourself and your company and make sure that your contracts are solid and foolproof. 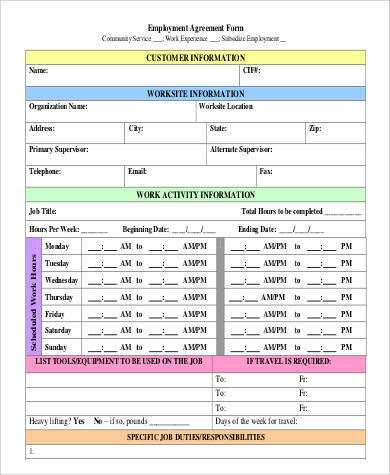 Download our free and easy to access sample template forms such as our employee contracts agreements to help you save on time and money.